Yesterday was quite wild at our house due to one of those unfortunate accidents that occur from time to time. Mandy and Darwin were playing somewhere in the house or yard, and when the dust settled, we discovered that Mandy’s ear had torn open at the bottom and was bleeding profusely. It is a fact of nature that such events always occur on Sundays when the local vet’s office, which I would have preferred to use, was closed. Between the screams of the 13 year old vet-wanna-be who didn’t handle her first dog emergency very well, the lack of paper towels anywhere in the (*&^&%$#$*^&* house, the length of time it took to get Mandy’s ear to stop bleeding, one very anxious lab (Darwin) who was worried that he had hurt his sister so kept trying to poke his nose right into middle of the healing ring, and a wiggly, bleeding husky basset hound mix who did not understand why we had to bandage her head, and why we didn’t want her shaking it, I was longing for an afternoon somewhere at a resort pool with a waiter catering to my every need, including lots of frozen drinks with pink parasols. This was especially true after I spent a good part of the morning holding Mandy down so Mark could bandage her at least four times. 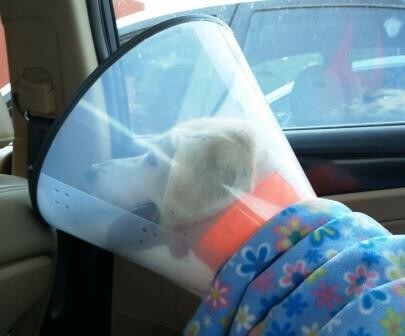 After we finished bandaging her up for the fourth time, we decided one of us had to make the 20 minute run to the nearest Pet Smart so we could buy a cone to keep the dog from pawing her ear. I had a sneaking suspicion that we wouldn’t be able to home doctor our way out of this one, so I asked Mark and Kayla to take the dog with them just in case. When they got to the store, Mark left Kayla in the car with the dog while he went in to PetSmart to get the cone, but after about five minutes sitting in the parking lot, Mandy let loose yet another giant shake of her head, causing the bandage to fly off her head, and the bleeding to start again, with the added bonus of copious drops of blood spattered all over the car, the dog and the daughter in the process. Kayla took Mandy out of the car after that to go find Mark, with the two of them dripping blood all over the local PetSmart. After that, Mark took Mandy to the vet at the back of the PetSmart store and left her there to get sewn up, which we found out would include general anesthesia, stitches, injected antibiotics and pain killers and medicine to take home, automatically ensuring a Very Large Vet Bill. The people there were very nice, professional and helpful, though. While Mark and Kayla were dealing with Mandy and PetSmart, I was at home trying to reassure the anxious labrador and cleaning the kitchen. Once Mark and Kayla got home, we had about an hour and half, and then I needed to go back to pick up Mandy and pay the Very Large Vet Bill, run one more errand, pick up dinner and then head home while I tried to drive, talk with my daughter and keep the dog from banging the cone hard enough to bust her haute couture priced bandage job back open in less than an hour. Mandy – the orange is a bandage, not a collar. The vet’s bandage job has survived at least through this afternoon. If we’re lucky and we can keep it dry and clean, it won’t need to be changed at all this week. 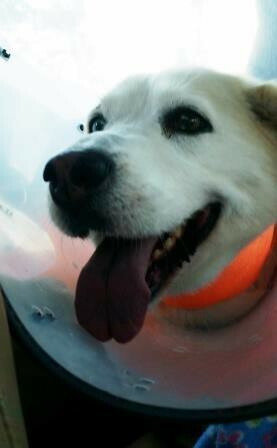 Mandy is very unhappy about the cone, but she will have to learn to live with it until she’s better. We learned that lesson the hard way when Tyra’s tail got infected. Have a great day! I’ll keep you updated. 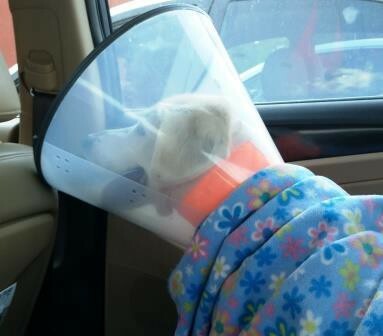 This entry was posted in dogs, Humor, On the Home Front and tagged Bandaging a dog's ear, cone, dog, dog injury, dogs, humor, PetSmart, vet, working mom. Bookmark the permalink. Thanks! Oh – you mean the dog, not me! How do they know when it’s Sunday? It sounds like a very bloody experience! Glad the doggie is all taken care of. Good luck! How do children know that the time to get sick as 1 a.m. on a weekday morning rather than 3:30 p.m. on a weekday afternoon when you know the doctor can see them?